Posted July 31, 2014 by roasbund-admin & filed under Indoor Plants. Light gives life. Imagine a world without the sun shining– it would be a cold and cruel place. Indeed, humans and animals and plants all need light to live and grow; it’s essential, just like air and water. For plants that need low light locations, the best window(s) are east-facing ones, where the cooler morning sun hits them. Low light plants can also go in front of north-facing windows. The shadiest parts of a home typically include hallways, staircases, and windowless rooms. Artificial indoor plant lights are available to help grow plants in places where they otherwise might not grow. Plants use the cool blue/violet hues of the color spectrum for their foliage, and the warm red/orange hues for flowering. Therefore, you’d want to buy light bulbs made specifically for plants, rather than using your typical room light bulbs which give off green/yellow hues. If your plant has brown patches on its leaves, or the leaves look faded or very dry, they’re probably getting too much light and should be moved. If their lower leaves are turning yellow or they don’t seem to be growing at all, they probably need more light. For more plant care tips and information, bookmark this blog. 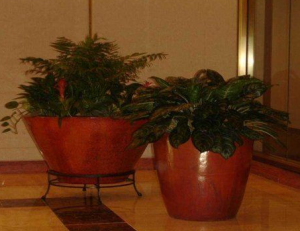 You’re also welcome to call Foliage Design Systems of Birmingham at 205-229-3043 to ask about plant care and such.